Breaks can range from minor chipped enamel with no pain to catastrophic splits with toothache pain. Each is dealt with uniquely. “How much is a filling?” is a very vague question that cannot be answered without understanding what exactly is to be done. If small enough, the rough area can be smoothed over with a polishing drill and left as is. The dentist will need to know why the tooth chipped to prevent it happening again. Some common reasons are trauma (knocked it), bit hard on something, weakened enamel from acid erosion (such as acid reflux, frequent softdrink or lemon consumption), weakened teeth from previous dental fillings, or dental decay. 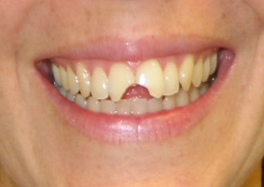 Front teeth can be filled with white composite resin, as an immediate fix. Front teeth are the first contact with food, and are under a lot of strain everyday. Enamel is very strong, however once a piece has broken, the replacement material – white composite resin – is nowhere near as strong. It is advised not to bite hard on composite resin, as repeated breakages can occur. Stronger porcelain alternatives are available. eg porcelain veneers. All treatment will be aimed at reducing the pain as a priority. Here the dentist may use a medicine over the decay, and place a simple filling. This will give the tooth some time to heal. If the tooth recovers, a stronger filling can be placed over the softer filling a few months down the track. Or a porcelain crown or gold crown may be advised. If the pain does not improve, your dentist may consider root canal treatment. The stresses on molar teeth are even higher than front teeth. When a breakage needs repairing, we have a choice of materials to fix the hole. White materials placed directly into the hole. 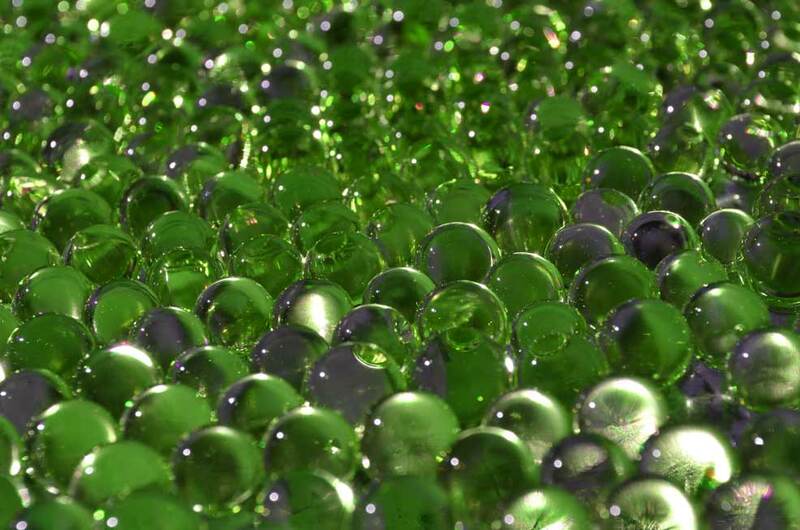 Composite resin is a standard filling material, however it does have limitations. It is not as strong as the enamel so it can break or weardown over time. 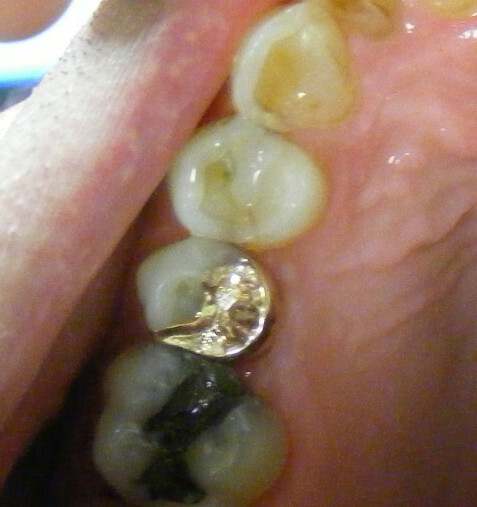 A major concern is leakage under the fillings. Regular monitoring with Xrays will help monitor this risk. Daily flossing will reduce this risk considerably. Metal amalgam placed directly into the hole. This very strong metal filling does not wear or break or leak as much as composite resin. However it has fallen out of fashion due to its grey appearance. Many people still have old amalgams in their teeth, which is testament to their enduring nature. Some amalgam blends have undesirable properties like swelling with time, causing cusps to fracture. As both these materials have problems, dentist may recommend some more long term restorative options. Cast restorations are stronger and often outperform standard fillings. They require more production time, and consequently cost more than a filling. However the extra expense pays off long term with teeth lasting for years, instead of repeated refilling. A range of materials. Bottom left molar is amalgam. 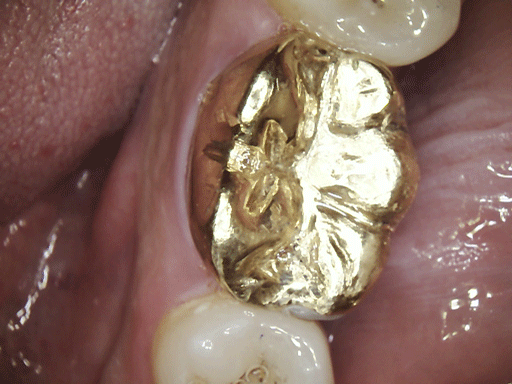 Premolar is a gold onlay. Next premolar has a white resin filling. 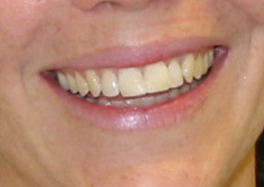 The right side teeth have been crowned with a combination of metal and porcelain. Cast restorations like this gold one (the beautiful glowing one on the left), involve drilling out the old materials and decay from the tooth, and taking a mould of the tooth. The tooth replica is then sent to the dental laboratory to make a dental onlay. The choice between gold and porcelain will be guided by your dentist, and the patient’s personal preferences. When the onlay piece returns, the dentist will glue it into the hole. The cost for this type of restoration ranges from $900 to $1500, depending on complexity. Crowns cover the entire tooth, and wrap it up to help prevent future breakages. Crowns are ideal for heavily broken down teeth (ie more filling than tooth). Teeth that have had root canal treatment will benefit from the protection of a crown. Crowns are strong, look great and last a long time. Mostly they are made of either ceramic, metal or a combination of both. The crown gives support and the patient is able to eat again. Ceramic crowns are also available. What are the advantages of gold? : <– This page was written by a dentist to other student dentists, but it gives a glowing recommendation for gold cast fillings when considering longevity. Sixty years of life is outstanding for a dental restoration. Compare this to white, composite resin which is given a service life of approximately 5-7 years! Make an appointment at Bytes Dental Ballina via the enquiry form.